Just checked the nest cam and saw a nest exchange. 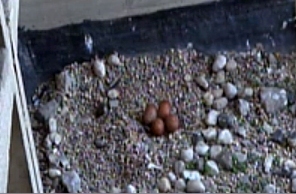 UIC has FOUR eggs, not three. Note the scraped Nitz and her mate have constructed. It is so perfect, it almost looks like someone went out and built a small campfire pit! It watched Nitz stretch her back legs out from under her to kick a big rock into the correct alignment. Pretty OCD, but the scrape is very photogenic.